There's no denying that the best dresses always come out to play in winter, given the fact party season takes place across November and December. In other words, you're more likely to find a frock that's really special—one you'll be really excited to wear—this time of year. From high-shine and sequins to luxe textures like satin and velvet, the dresses on offer are as tasty as the treats you'll find in a box of Quality Street chocolates—and the colour palette isn't too dissimilar, either. However, the big concern is how to wear a dress to a winter wedding without succumbing to frostbite. Really, it's down to two things: silhouette and styling. Initially, you'll think that shorter hemlines are a no-go but that isn't necessarily the case. 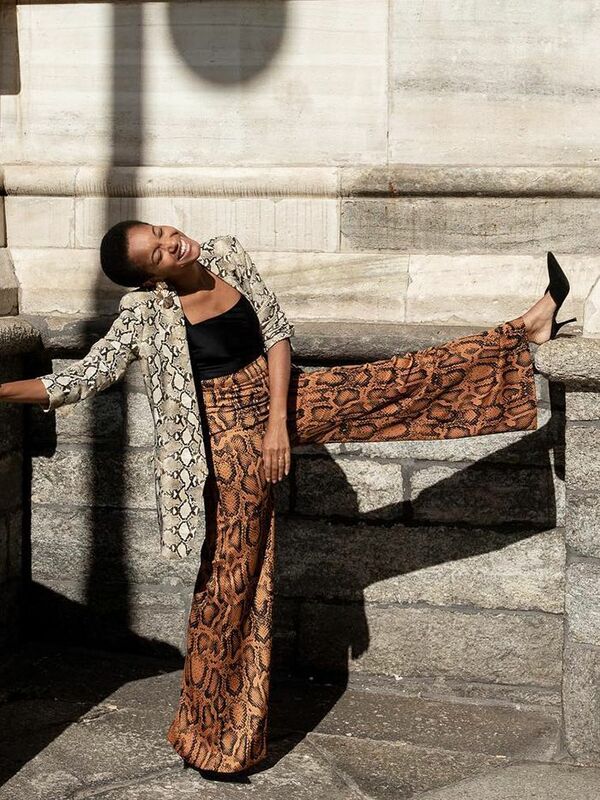 Tights have made a big comeback on the street style scene this season, and they can actually make a lot of dresses look cooler, too. Take Florrie Thomas, for example. Her floral asymmetric-hem dress looks more directional yet no less fancy with her sheer polka-dot tights. Another dress feature that's ideal for winter weddings is high necklines. Seeing as most of your body heat escapes from your torso, high collars mean you'll retain it more effectively. Throw in a midi hemline and closed-toed shoes and you shouldn't feel the chill, be it at the service or in the airy reception. This dress looks so much more expensive than it actually is. Pair it with black suede courts, because open-toed shoes are a no-go right now. This thick fabric will help keep you toasty during the inevitable walk from the ceremony to the meal. Cinch in the heat with the contrasting wrap belt. Sleeveless it may be, but the ankle-grazing length provides ample leg coverage. Just add a cropped faux-fur jacket to keep your arms happy. Long-sleeved, midi and double layered. This dress was made for winter nuptials. Minimalists will love this subtly draped dress. Layer this slip dress over a mesh long-sleeved top to make it more winter-appropriate. Whoever said you can't wear black to a wedding clearly hadn't seen this dress. Made from a gorgeous crepe material, this beaded number will keep you warm while making a serious statement. The tie-neck detail makes up for breezy cold-shoulder silhouette. If you have a penchant for cutouts, ensure they sit in places easy to cover up while you're outdoors. This tuxedo jacket will look chic with a button-down blouse or a flip-hem skirt worn underneath. Plus, more layers makes for more heat. The fluid silhouette will forgive you, should you want to wear a Heattech vest underneath. This Lurex dress will look stylish with a belted blazer worn over the top. It's simple—velvet will keep you warm. The long sleeves won't go amiss, either. Sequins aren't just for Christmas parties. We suggest wearing this to both weddings and seasonal gatherings to get more wear out of it. Counteract shorter hemlines with a high ruffle neck and long sleeves. This is a prime example of a dress that will actually be improved by sheer black tights. This floral print is crying out to be clashed with lacy tights. Again, the double layering on this dress basically acts in the same way as insulation. Wear this dress with sock boots to keep your feet cosy. Just think how cute this minidress will look with sheer polka-dot tights. Throw a tuxedo jacket over the top and you'll look as if you've just event-hopped from a swanky film premiere. Roomy enough to wear a slip underneath (another easy way to cheat some heat). You need to see the back of this dress—definitely worth braving the chill for. This dress is considerably more flatting in real life than it is on the hanger. Style this dress like a fashion editor with closed-toed mules and a grey checked maxi coat. Give this tulle frock an edgy overhaul with a leather biker jacket. 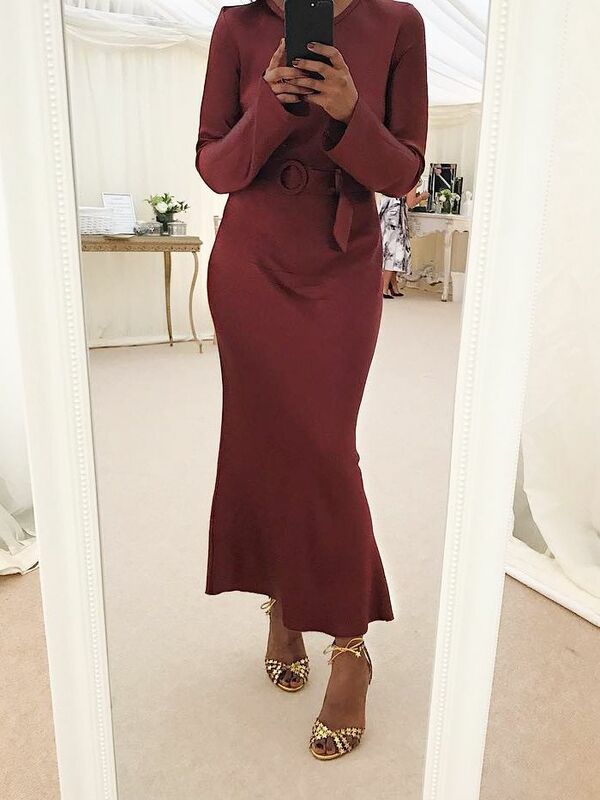 If the weather forecast is looking grim, it's worth noting that the fluted sleeves on this satin midi will look elegant over a gold long-sleeved top. We've never been happier that high necklines are back for the 2018 festive season. The cuffed sleeves will ensure chilliness is kept to a minimum. Pencil silhouettes cancel out any risk of chilly wafting.